Reliance Jio has launched new offers as Jio Dhan Dhana Dhan offer after the termination of Jio summer surprise offer. In the first week of April month, Jio has announced a special summer surprise offer for its prime subscribers. The company offered free 3 months complimentary service for recharging Rs.303 or any higher value. Surprisingly the offer was withdrawn by Jio as per TRAI’s recommendation. What is Jio Dhan Dhana Dhan Offer? Now Jio comes with a new offer for who are not recharged for summer surprise plan. 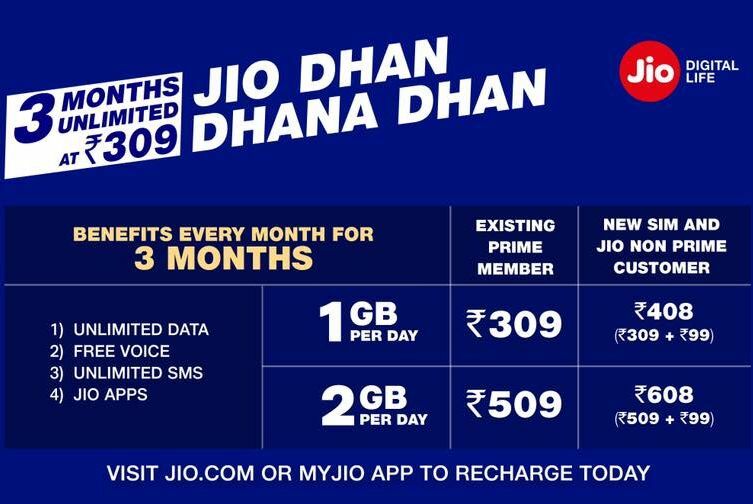 This Jio Dhan Dhana Dhan offer comes with two plans. This offer is same as summer surprise offer with some slight price changes. If you are already a Jio Prime member, you can use this offer. Rs.309 plan offers users will get unlimited voice calls, SMS and unlimited data ( 1 GB high speed data per day). It comes with validity of 84 days. Jio Rs.509 offers users will get unlimited voice calls, SMS and unlimited data ( 2 GB high speed data per day). It comes with validity of 84 days. Jio Prime members can avail this offer as well as first plan. Also Jio Non-Prime customers can get this offer through getting a new SIM card and have to pay extra Rs.99. If you are a Non-Prime member, you can avail those above offers only in first recharge for Rs.408 and Rs.608 respectively. Jio has announced this offer is not available for already who recharged Rs.303 or more in the summer surprise offer. If you have already recharged Rs.303 or any higher plan before the summer surprise offer termination, you can continue enjoy the 3 months complimentary offer. Note: If you do not recharge any value yet, the last date for recharge or joining as prime member is April 15.